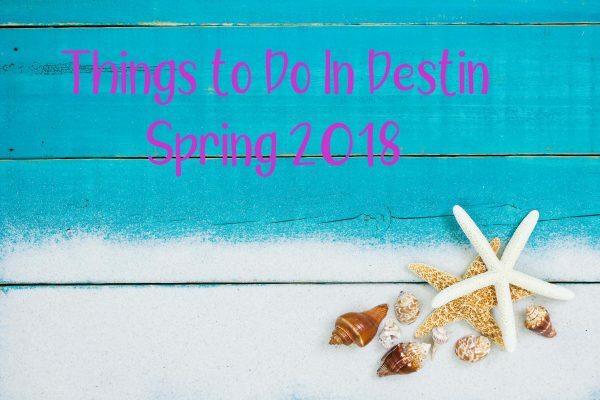 Spring is a Great time to visit Destin. April 20 – ArtWalk and Easter Bunny at Destin’s Harborwalk Village. From 11 a.m. to 4 p.m., the Destin Harbor will feature kids’ activities and the Easter Bunny will be in attendance for meet and greets and pictures with the family. In addition, local and regional artists will be set up along the waterfront from HarborWalk Village to AJ’s. Stroll the harbor and enjoy the art, the view and the activities for kids. April 19 – Easter Explosion at the Village of Baytowne Wharf in Sandestin. From noon to 3 p.m. on Saturday, the Village will be filled with fun activities, including inflatables, lawn games, crafts, and of course, the Easter Bunny himself will be there. April 23-27 – Emerald Coast Volleyball Week features teams from around the country competing for top spot in a variety of categories, including men’s teams, women’s teams and co-ed teams. The tournament takes place at the Boardwalk on Okaloosa Island. Sign up your team or cheer on the teams as a spectator. Visit www.EmeraldCostVolleyBall.com to learn more. April 24 – The Finest on the Emerald Coast will host more than 90 booths offering delicious food, great entertainment, silent auction items and more from 6 p.m. – 9 p.m. After dark, Fireworks will light up the Destin Harbor with a spectacular show sponsored by The Emerald Grande at the HarborWalk Village. Tickets are $25/person. An assortment of over 800 wines will be available to try at the Grand Tasting event on Saturday, along with delicious food to pair with the variety of wines. There will also be tasting seminars, Champagne Lane tastings, Spirits Row, chef demos and Nashville Songwriters Showcase.